Cloisonne enamel and glass ware, both materials embodies clear and transparent beauty of winter. Two artists portrays delicate snowscape and flowery New Year's greetings with their charming touch. I create my work with the technique of cloisonné enamel ware, and my main motifs are Look beautiful, Look appetizing. Mulini, the traditional technique of Venetian glass is a source of my unique figure. 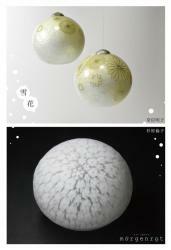 I produce plates arranging hashed tessellated glass bar without break first, and freely shape these glass plates by heat. The work performs lovely stories that warm people hearts, and may give a little chuckle sometimes.